Post Ph.D. in Information Technology, Universidad de Girona, España. Certificate in Information Security. Software Engineering Institute, Carnegie Mellon University, USA. IEEE DVP (Distinguished Visitor Program) for Latin-American. 2004 – 2009. 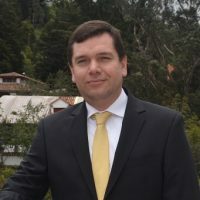 “Distinguished Professor”, given by Universidad del Norte, Colombia. National Award of Operations research given by The Colombian Society of Operations Research. 2004. Velasquez C, Donoso Y. “Delay/Disruption Tolerant Networking-Based Routing for Rural Internet Connectivity (DRINC)”. International Journal of Computers, Communications and Control (ISSN 1841-9836) 12 (1), pp. 131-147. 2017. Lozano C, Molina M, Donoso Y. “A Multi-Objective Approach for a Multihoming Load Balancing Scheme in WHN”. International Journal of Computers, Communications and Control (ISSN 1841-9836) 11 (2), pp. 259-272. 2016. Maldonado F, Calle E, Donoso Y. “Checking Multi-domain Policies in SDN”. International Journal of Computers, Communications and Control (ISSN 1841-9836) 11 (3), pp. 428-440. 2016. Montoya G, Donoso Y. “Delay-Sensitive Optimization Models and Distributed Routing Algorithms for Mobile Wireless Sensor Networks”. International Journal of Computers, Communications and Control (ISSN 1841-9836) 11 (6), pp. 819-831. 2016. Velasquez C, Donoso Y. “Delay/Disruption Tolerant Network-Based Message Forwarding for a River Pollution Monitoring Wireless Sensor Network Application”. Sensors (ISSN 1424-8220) 16 (436), pp. 1-25. 2016. Consultant in Computer Networks and Information Security. Teaching 20%, Research 50% and Curricular Committee 30%.